Continuing on the theme of last Friday’s post “Barry” – Class Warrior?. How would someone define a “class war”? I would contend that any shifts that significantly favor one socio-economic group over the opposite group would qualify. To that end, let’s consider some areas that would be affected by a class war: Tax Policy, Income Distribution, Labor Unions and Socio-Economic Mobility. 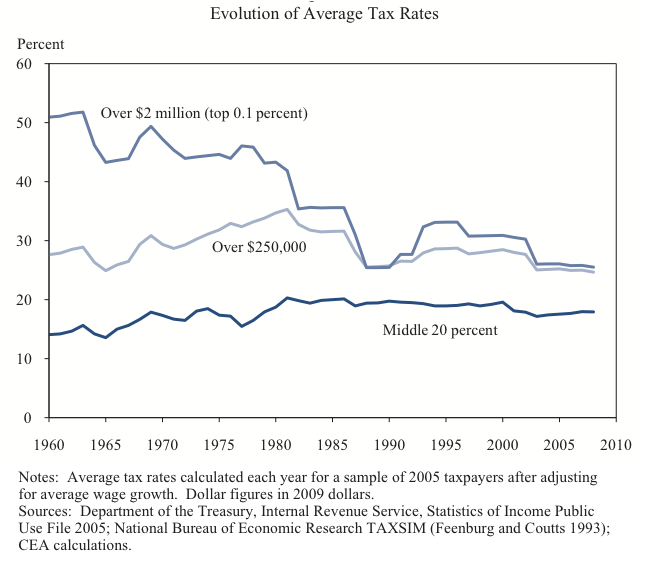 Looking at this graph it would appear that tax rates for the rich have dropped significantly while middle class taxes are slightly higher. It is clear that the rich have done much better than the middle class when it comes to real income gains in recent decades. There’s no doubt that labor unions help the working class while doing nothing for (or perhaps hurting) the rich. Labor union membership has dropped dramatically since the 1960’s. Even more dramatic has been the drop in work stoppages which seems to have accelerated after the firing of striking air traffic controllers in 1981. It’s probably not a coincidence that middle class wages have stagnated ever since American unions became insignificant. In the US, a father’s income has more influence over his sons’ income than in most developed countries. Meaning that kids from poor families tend to be poor adults, while kids from rich families tend to be rich adults. Only Great Britain and Italy have worse socio-economic mobility than the US. Based on these statistics, it appears the class war started around 1980 – and the middle class is getting clobbered! 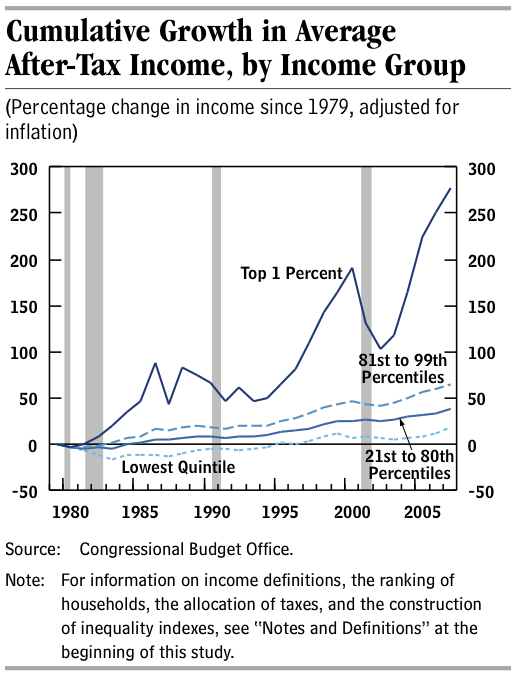 Looks like there was a president far more skillful at class warfare than Barack Obama. Ironically, it’s the hero of Power Line – Ronald Reagan. Well done. Even the phrase “labor union” has been decreasing in use greatly. Just for fun, let’s compare that to “tax cut”. 1. They negotiate better wages. Most employees don’t have the time, knowledge or power to effectively negotiate better pay. Management has a big incentive to keep workers wages low. When there isn’t significant push-back from workers, they tend to get their way. Of course, then they reward themselves with huge bonuses for increasing the company’s profits! 2. Unions help to balance the influence of corporations on government policy. Look at our relationship with China, for example. They have unilaterally set their currency significantly below where it should be to ensure a competitive advantage over American manufacturers. They also don’t have many of those pesky worker or environmental protection laws – yet we engage in free trade with them?! Why?! Of course corporations love it, it increases their profits and gives them justification for keeping American worker’s pay low. After all, we have to be “competitive”! But imagine if unions had as much influence over policy as corporations do. Would we be engaging in “free trade” with China? I don’t think so. True. Non-union workers also benefit from the better working conditions that unions fight for – like the 40-hour work week. The poor bastards working the steel mills back in the late 1800’s had to work 12-hours a day, 6 days a week. Of course to our friends at Power Line, the 40-hour work week is probably just another costly, job-killing government regulation! Yeah right. I mean clearly if you could work each employee 60 hrs per week, you would need more employees.